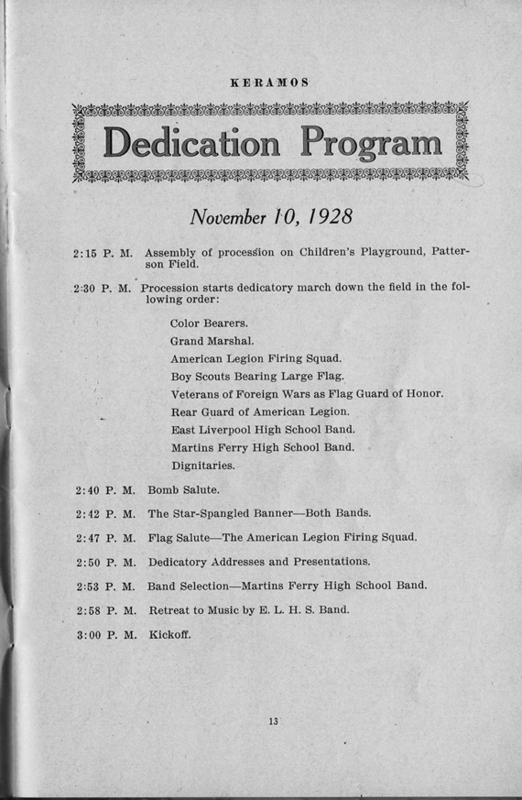 From a special Keramos Publication Titled "Dedication Number. November 10, 1928"
LET us shout., Hallelujah! A miracle has occurred. The "Old West End Park," always an eye sore to our public-spirited and enthusiastic citizens, has been transformed into a modern athletic plant. Now that this transposition has taken place, thus assuring our community a new era iii athletics, again let us shout, Hallelujah! A visitor will ask what has been done to effect this transformation? We will recapitulate. Picture in your mind, a combination of rubbish- dump, garbage heap, and mud-hole, reeking with all the associated odors surrounding such places, and your senses of sight and smell will formulate in your mind, an idea of what "Old West End Park" formerly appeared to be like. Since the first of this present year of 1928 the Board of Education has been working toward the ultimate goal of giving our high school students and athletics in general a respectable playing field, on which to stage all kinds of athletic contests. Last year the retiring Board engaged an engineer to draw plans of the proposed field, now called Patterson Field, carrying the name of the philanthropic donor. They also contracted for the high grade wire fence, you see about this enclosure. It remained for the present Board to carry on his good work and so, the engineer was retained, bids were received on the tentative plans, contractors were en- gaged, and before you is the result of the efforts of all. The field presented, as it was, a problem in drainage, but by good engineering this problem has been solved by underlaying the entire main playing field with a network of pipes, that lead into a main drain, running down the center of the field, adequately large enough to carry off all water that falls on the field. This main drain runs directly through the property of the Pennsylvania Railroad and into the river. The engineering feat of jacking corrugated iron pipe through and under this railroad was one of the greatest achievements in the annals of modern engineering. Along with this drainage system there is constructed on the south end of the main drain, a special manhole, equipped with regulating valves that will control flood waters in and out of the field. The top of this man- hole is of monumental design and inscribed with the words "Patterson Field. After the drainage system was completed, the field was graded by being arched in the center and sloping off to the sides, thus providing a quick natural drainage to all surface waters. These surface waters are carried out to the center track surrounding the field under which is laid ordinary farm tile that carry this surface water and dump it into the inahi drainage system. The grading of the practice field was also completed along with that part of the lot intended for tennis courts, horseshoe courts, quoits, etcetera.- While the grading was being done, the fence was constructed on a raised platform of graded land running the entir.' circumference of the field. Then came the blow. There were no funds to appropriate toward the building of a suitable stadium, so it remained for the Board to tear down the old semi-circular graded stand and rebuild it along the forty-foot piece of land that was most graciously given us by the Standard Oil Company. Shelter was needed for the players, so a cheaply constructed temporary building was put up and sided with corrugated sheet metal. Next came the building of ticket booths, these were made of birch constructions and are permanent buildings. Inlaid into the front wall of each of them is a circular monogram with the letters "E. L." inscribed. This is a brief resume of what has been done to make the field a tribute to the name of the donor and a valuable asset to the athletics of this community. It is true the work is not completed, but as funds become available for this purpose, surely they will be applied to complete the building program. The next issue that faces us as citizens, is the building of a stadium to insure us the comfort and many advantages that these edifices afford. Many of us have no doubt contemplated the building of such a structure, hut, to date no definite plan of financing has suggested itself. The School Board can not hope for funds to finance this project in the near future, because there is now a dire need for more buildings to accommodate the increasing school enrollment. Can the citizenship of this community devise ways and means of financing a stadium? They can, if they so desire. Next spring the main playing field will be sown with grass; a caretaker will no doubt be employed to care for the interests of the public at large and the baseball diamond will he laid out and perhaps the children's playground and tennis courts can be made suitable for play. In all, can you picture this old lot transformed into a beautiful green grassy sward, with a main football field, a practice field, two baseball dia- monds, four indoor-outdoor baseball diamonds, tennis courts, children's playground, and a fine large stadium along the entire west side of the main football playing field? Shall all this come to pass? We are living in hopes that it shall. Then again we can shout, "Hallelujah! Ilallelujah!" 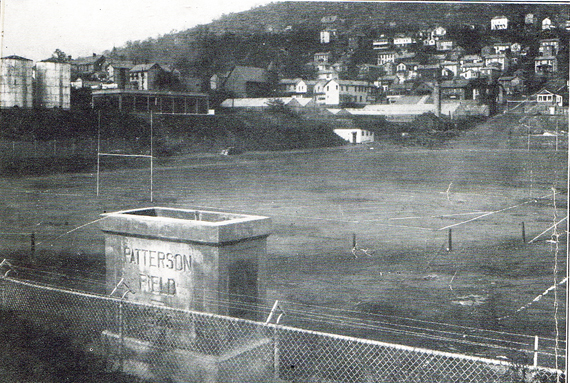 PATTERSON FIELD is named for the one, who about five years ago, so kindly presented it to East Liverpool High School for use as an tt athletic field. Monroe Patterson was born at Millersburg, Ohio, on January 7th, 183. He was educated in Millersburg Public Schools and later received a teacher's certificate. When Mr. Patterson was eighteen years of age he moved to Ironton, Ohio, where he engaged in the contracting business for about five years. In 1876 he came to East Liverpool and engaged in the manufacture of foundry products. The firm was known as the firm of Morley, Dixon and Patterson. In September, 1883, Mr. Patterson married Mary A. Thompson of Smiths Ferry. Mr. Patterson was known in East Liverpool as a philanthropist as well as a foundry operator, pottery manufacturer and banker. Some of his most outstanding philanthropic acts were the presenting of the athletic field to the community "for the youth of the community," the erecting of the "Mary A. Patterson Memorial Christian Home," and while keeping his identity a secret he made many gifts to the poor of the city. Mr. Patterson was an active church worker, being a member of the official board of the First Methodist Episcopal Church. He was a member of the Kiwanis Club, and was interested in the financing of the High School Band. 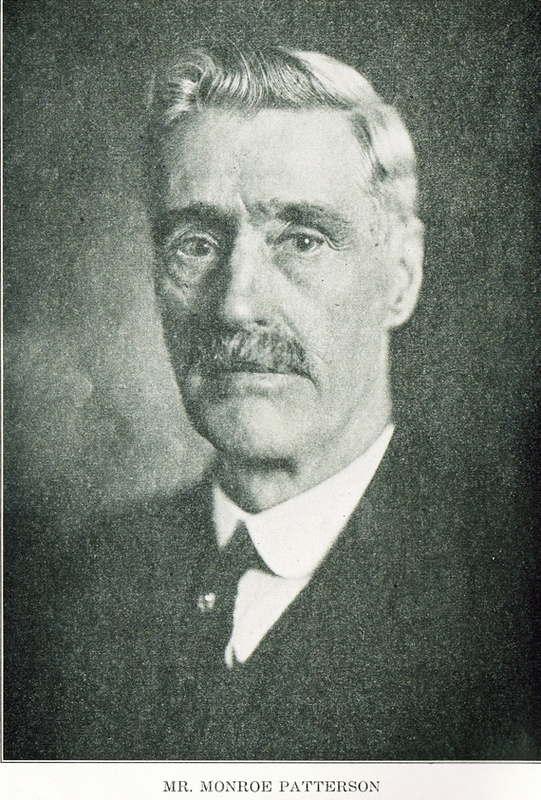 Mr. Patterson died of pneumonia on November 22, 1924. An injury received while working on the building of the "Mary A. Patterson Memorial Christian Home" about three weeks before his death, while not rendering him bed-fast, is believed to have hastened his death. East Liverpool will never forget Mr. Patterson, and even to the young of the community who never knew him, Patterson Field will stand as a memorial to a great citizen.